French Army, 200,000 General Petain German Army, 215,000 General von Ditmurth The infantry attack along the 20 miles of Champagne front had been timed for 9.15 a. m., September 25, 1915. At the indicated moment, the French troops climbed out of their trenches and, at double quick, broke in a first immense wave against the German trenches, 660 feet away, an African cavalry brigade under General Baratier participating. No sooner did one wave of infantry sweep forward than another surged up behind it, flowing impetuously in the same direction. The French advance submerged the entire first line of German trenches, advancing past the batteries to the heights south of Py. Foremost in the rush were the daredevil African Corps and the Moroccan troops, led by the brave General Marchand, who fell mortally wounded at the moment of victory. The Germans, taken by surprise, had shown but little resistance at the onset. Now they brought their machine guns into play and opposed every step of the French advance. The two French wings were subjected to a converging gun fire, followed by counter attacks on their flanks, which served to check their progress. The center columns, however, steadily advanced, day by day, fighting every inch of the way. By September 27, 1915, these columns had advanced one to two miles, taking 3,000 prisoners and 44 cannon, and part of the advance had almost reached the second line of German trenches. Many German batteries were captured, whose artillerists were found chained to their guns. The heights north of Massiges, which the Germans deemed impregnable, were scaled in fifteen minutes, the Germans surrendering in masses. The advance along the crest of this ridge was made with difficulty in the face of a withering machine gun fire. The French were compelled literally to blast their way through with hand grenades, which were passed along from hand to hand in an ever-lengthening chain of grenade bearers, much as buckets of water were passed from hand to hand in the old fire-fighting days. For eight days, from September 25, 1915 to October 3, 1915, the battle of Massiges Heights continued without respite and with unexampled fury, but inch by inch the Germans finally were compelled to yield the ground. Possession of these heights enabled the French to extend their lines and take by a flank movement the sections of first line trenches which they had failed--to capture by a frontal attack. 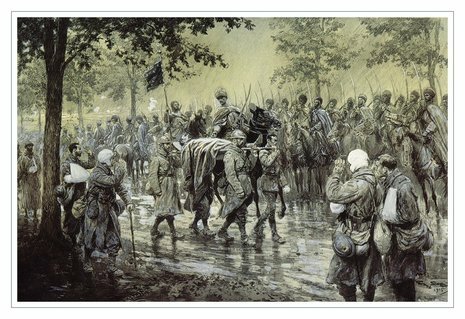 In 12 days the French penetrated the German lines to an average depth of two miles on a 15-mile front, taking 25,000 prisoners, 150 guns and a vast quantity of booty. More than 140,000 Germans had fallen dead or wounded, while the French losses were upward of 100,000. On October 7, 1915, a fresh German Army of 93 battalions, numbering 100,000 men, was recalled from the Russian front to Champagne, and began a counter offensive. They failed, however, to regain their lost territory or to drive back the French. By the middle of October the Champagne Battle had ended in a stalemate. 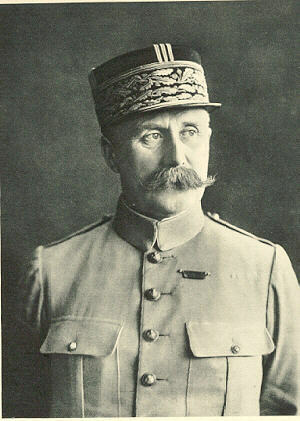 The tactics of the French commanders had an immediate strategic result of the first importance, for by compelling the Germans to draw their Eastern Armies to support the Champagne offensive, they aided the Russians in stopping the German drive in the East. On the first days, the offensive was successful and the Germans lost ground. Artillery fired a heavy bombardment for 3 days and then the advance began. 2 miles (3 km) were gained. The next day, reinforcements arrived for the Germans and the offensive lost momentum until it finally ended on October 6.